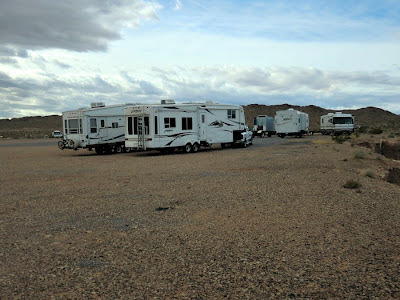 A couple of years ago, when we were holidaying in Nevada and Arizona, I often noticed one or maybe two RVs parked down a dirt road with no visible utilities, etc. 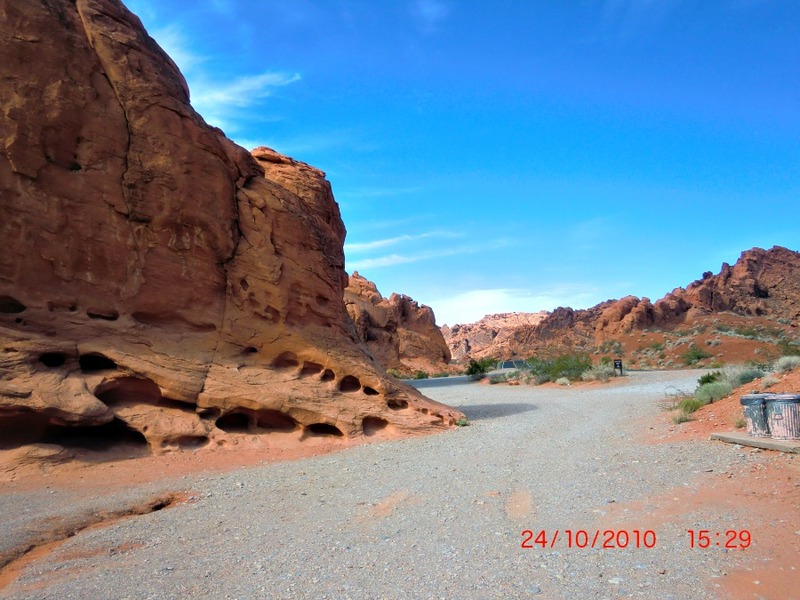 way out in the desert. My goodness I thought, how poor these people must be to live that way. Arch decided to find out what was going on and approached a man working outside his RV and asked why they were there. 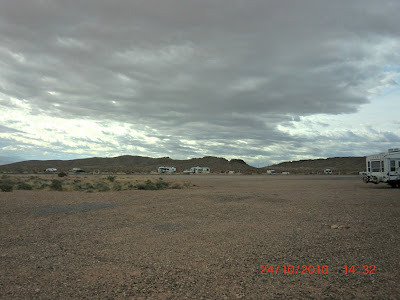 "Oh" he said "This is Poverty Flats and we are boondocking here while we visit Las Vegas"
They didn't look very poor to me but we had no idea what boondocking was and the man was not very chatty so we left. These are pretty fancy RVs for poor people don't you think? Their view of the surrounding area was spectacular. And you can see the sun shining on the Valley of Fire in the distance. Right click on the pictures for a larger view. I now know that boondocking generally means camping in remote locations without the electrical, water and other services we have come to expect. 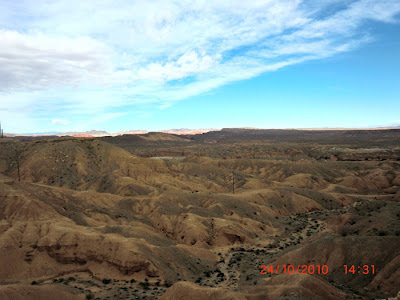 That is what the people we saw scattered around the Arizona Desert we doing. Many of them are very well equipped to do this with solar panels, propane refrigerators, etc. 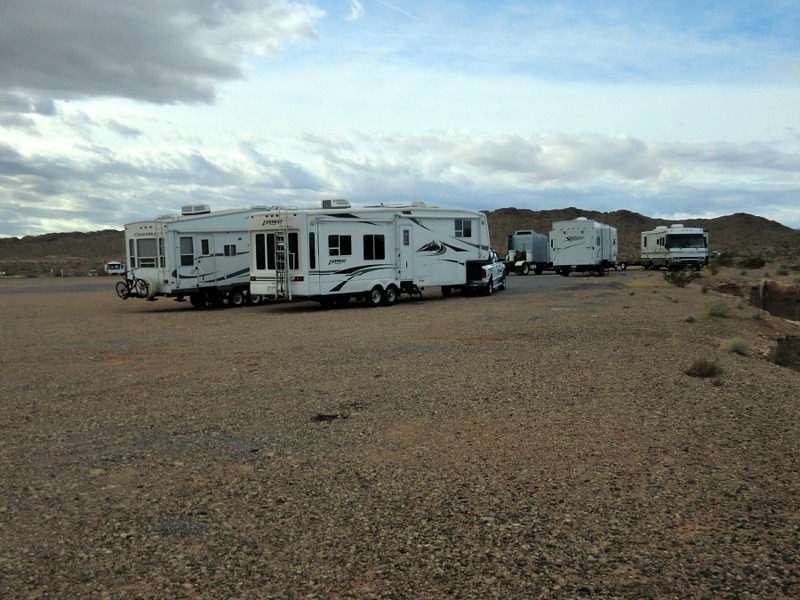 They save a lot of money on camp sites and enjoy the independence and freedom boondocking offers. 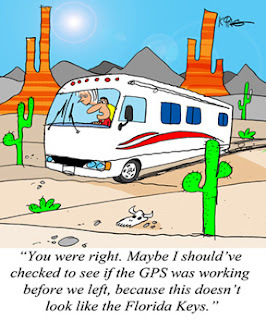 I follow the blogs of several people who boondock on occasion including The Bayfield Bunch from Bayfield, Ontario, RV Sue and Nina and Paul at Wheeling It. They all seem to enjoy it a lot. There is also a website that RVers can join where people can book boondocking sites on other RVers property and in exchange offer space on their property to boondockers. We thought that would be a great way to meet other RVers and learn a bit from their experience so I joined the site and we offered a space at Bay Hammocks. So far three boondockers stayed with us and their advice and tips have been most helpful. Will we boondock? I am not sure. Maybe not this year but we may be forced into it when we have the RV painted and at Woodstock, NB before we cross the border into the US. All the campgrounds in that area are closed in October so we may end up at WalMart.